Visual Studio Code>Other>DashboardNew to Visual Studio Code? Get it now. Organize your workspaces in a speed-dial manner. vscode-dashboard is a Visual Studio Code extension that lets you organize your projects/workspaces in a speed-dial like manner. Pin your frequently visited folders and files onto a dashboard to access them quickly. The dashboard is a dedicated webview inside vscode that is opened when the welcome page is shown. It can also be opened via command. Clicking a project opens it in the current window, while strg+click opens it in a new window. Adding a workspace or file (project) can be done via command or button. First a project type (folder or file/multi-workspace) has to be selected. You are then prompted to provide a name, path and an optional color. Projects can also be separated into project groups. When adding a new project, you are prompted to select an existing group or create a new one. Editing the project list currently has to be done manually by editing a JSON file. Emojis may (or may not, depending on your preference) be good icons for projects. You can add them by pressing WIN + . (under Windows) while naming the project. Only colors defined by the theme were used. 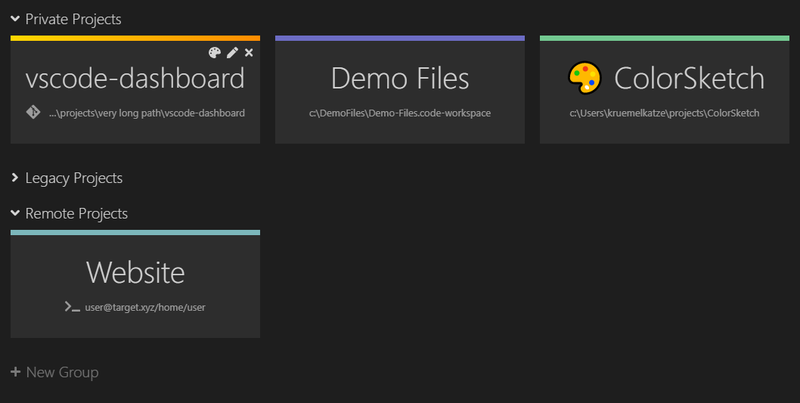 So the dashboard should always blend nicely into your VSCode design. If not, you can customize them in the settings. vscode-dashboard automatically detects if a project is a Git repository. If so, this is indicated by an icon.